Break the students into lunch groups and have them play the board game. When they land on a space, have them make the sentence “how many times have you ~.” I have yet to try this, but ideally one student asks another the question. Based on the other students answer, the student gets to move that many spaces forward. I have yet to think of a good way to prevent cheating though. The trick to getting students to play board games properly, and actually make sentences, is to reward them for speaking English, rather than punish them for not speaking English. It helps even more if you can find a way to make the English essential to the gameplay. This board game is based off of one found on Englipedia (http://jhsenglipediaproject.com/). The text and images have been changed, but the layout is the same. 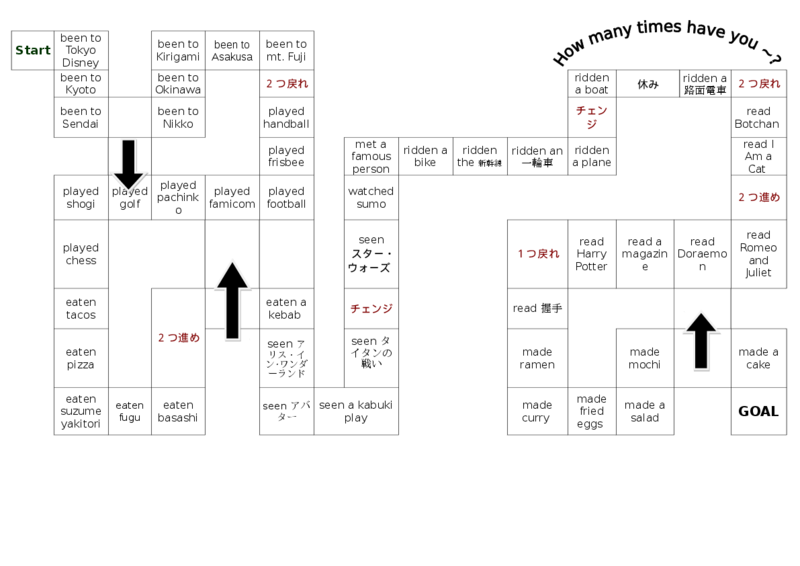 The original is "Past Tense Dice Game" and can be found at http://jhsenglipediaproject.com/JHS_Textbook_Game_PastTenseDiceGame.aspx . "Past Tense Dice Game" was submitted by Lynn Bunter, and originally inspired by or borrowed from Lanternfish.